Cupid, a Roman god of love - who often turns up on Valentine cards - is not the only winged being linked to February 14. Medieval Europeans believed that many birds mated on this day, underscoring Valentine's Day's natural link to affection and courtship. The nine species of lovebirds (genus Agapornis) are native to Africa. These colorful birds snuggle close to one another and gently preen each other's head and neck, whether it's Valentine's Day or not. It’s nearly Saint Valentine’s Day. Celebration of the day devoted to sweethearts goes back to Roman times. Doves were the classic lovebirds, and favorites, too, of Cupid’s comely mother, Venus. Today, we cherish lovebirds from the pet shop. The lovebirds – there are nine species – are diminutive parrots native to Africa. 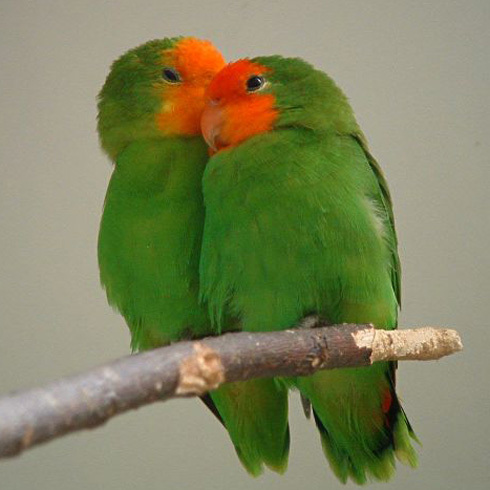 The colorful lovebirds are aptly, if anthropomorphically, named for their snuggling behavior. They nestle close to one another, and gently preen each other’s head and neck with their red bills. Mutual preening helps keep the feathers clean precisely in those places where the mate cannot preen itself. But it’s also crucial in the lovebirds’ courtship, fostering enduring bonds between the pair. BirdNote wishes you and yours a happy Valentine’s Day. Share the love at BirdNote.org. I’m Michael Stein. Bird calls provided by The Macaulay Library of Natural Sounds at the Cornell Lab of Ornithology, Ithaca, New York. Turtledoves recorded by A.B. van den Berg; Lovebirds recorded by L. Wilme. Liebestod from Tristan and Isolde by Wagner. Performed by the Seattle Symphony. Gerard Schwarz, conductor.